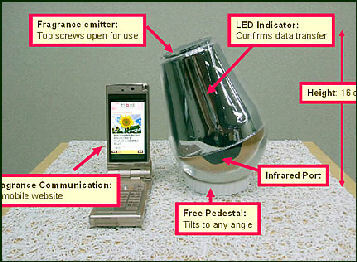 cell phone fragrance system Digital cameras are big sellers for Japanese electronic companies. As of 2006, Japanese companies produced 80 percent of the world’s digital cameras. Many manufacturers have suffered though as result of stiff competition and low prices. In July 2008, a company called Plaza Create began selling a disposable digital camera with recyclable liquid crystal panels taken from old cell phones. The 27-exposure camera sell for about $12. A 50-exposure model, $14. Cell phones in Japan are arguably the most advanced found anywhere. They have high resolution screens that produce sharp images and third generation networkz that allow use to shift through pages quickly. The only problem is in many cases Japanese phones can not be used outside of Japan. In 2000, cell phones showed rock concerts with no sound. Still images flashed quickly so they looked almost like a video. In 2001, Kyocera introduced mobile video phones with a small digital camera on the back that allowed people to send pictures of themselves to friends with the same kind of phone. Costing $335 when it was introduces, the phone was as small and compact as other cell phones. The images though were often jiggly. Japanese initially didn't take to the Internet on personnel computers with same enthusiasm as Americans but they quickly took to the Internet on the cell phones in a big way. In 2000, there were more than 40,000 web sites specifically designed for cell phones. In 2001, Japan introduced the "third generation" of cell phone technology with great clarity and the ability to transmit data and video on color screens. The 3G technology made cell phones into wallet-sized PCs and portable play stations and with that came ring that sounded like the roar of a Tyrannosaurus Rex, services that allowed users to check their Pachinko reaction times and security systems that allow them to eavesdrop on their pets or check their house for possible intruders. In the mid 2000s, Sony-Ericsson introduced Walkman cell phones that were like a cross between a cell phone, an iPod and a high resolution digital camera. Casio introduced models that were shockproof and waterproof and could be worn in the shower or on a scuba dive. Models for children had GPS so parents could figure out where they were. Japan's "Galapagos syndrome" is a phrase first coined to characterize the nation's highly evolved but globally incompatible cell phones. The term is now applied to other isolated industries, even to its people. In 2009, the global market share of Japanese cell phone makers combined was only three percent. “Japanese companies have been so pioneering in many fields, but they have failed to build a global business” of handsets, Gerhard Fasol told the New York Times. He is chief executive of Eurotechnology, a Tokyo firm that advises companies on global mobile and telecommunications strategy. “What you need is a global infrastructure,” Mr. Fasol said, “and Japanese handset makers have nothing.” The handset makers “need to stop worrying about the carriers and start thinking more globally,” said Shuichi Iizuka, a telecommunications analyst at the ISB Institute, based just south of Tokyo. With the domestic market shrinking Japanese cell phone manufacturers are beginning to gear up for more for markets abroad with smartphones with several firms including Panasonic , NEC, Casio and Sharp offering products in early 2011. Many of the Japanese producers will use the Google Android system and thus not handicapped by system that using a system that only works in Japan. Smartphone shipments in Japan in fiscal year 2010-2011 (market share) : 1) Apple (37.8 percent); 2) Sharp (24.3 percent); 3) Sony-Ericcson (9.8 percent); 4) Samsung (9 percent); 5) Fujitsu (8.8 percent); 6) NEC Casio (3.2) percent ); and Others (7.1 percent). [Source: MM Research Institute). In the fall of 2010 NTT Docomo, KDDI and SoftBank all began aggressive drives to push their smartphones. They all had new models of phones and new services and aps and promised plans to introduce super-fast service. Docomo began pushing waterpoof phones with e-money functions. Their Galaxy S smartphones were made by Samsung. As of May 2011, KDDI had launched six Android smartphones, including Sharp-produced Inforbar A01 and the Sony-Ericsson-produced Xperia. Softbank’s profits have surged on the popularity of its exclusive deal marketing Apple’s iPhones. In May 2011. Docomo released a new line-up of smartphones, including new versions of the popular Samsung Galaxy, Harp introduced the Aquos phone, which allows users to see 3-D images iwthout glassesm and NEC-Casio launched the super-slim, waterproof Medias smartphone. Japan electronics manufacturers provide many key parts for smartphones: Toshiba makes flash-memory devices; Elpida makes DRAM chips and Renesas makes chips, microprocessors and micorcontrollers for smartphones and other next-generation devices. All of the of these companies are putting their factories into overdrive to keep up with demand. South Korean and Taiwanese manufacturers also make many of the same parts. Recently Apple has been turning more and more to Japanese electronics companies for parts as it other main supplier--- Samsung--- is using many of its parts to make products that rival those of Apple. Mitsui Mining & Smelting Co. controls about 90 percent of the global market for ultrathin copper foils used in smart phones. Internationally the shares of Japanese companies in the handset market is relatively low compared to Nokia of Finland, Motorola of the United States and Samsung of South Korea. Nokia and Motorola, the No. 1 and No. 2 cell phone makers in the world have a very small presence in Japan. Vodaphone tried, gave up, sold out and left. These companies have not succeeded in part because their products are not up to the quality of their Japanese counterparts. In 2008, Nokia announced it was withdrawing from Japan due to it inability to crack the market there. Top cell phone makers in Japan in 2007: 1) NEC (17.1 percent); 2) Panasonic (14.1 percent); 3) Sharp (12.9 percent); 4) Sanyo (12.4 percent); 5) Fujitsu (10.9 percent); 6) Sony Ericsson (7.7 percent); 7) Toshiba (7.1 percent); 8) Mitsubishi (6.5 percent); 9) Casio (4.7 percent); 10) Kyocera (3.6 percent); 11) Others (2.7 percent). The cell phone handset industry in Japan is very competitive. As of early 2008 there were about 10 handset manufacturers and the industry was ripe for a major shake up. Soon after the start of the year Mitsubishi Electric announced it was going to stop make handsets and Kyocera bought Sanyo’s handset division. Disney introduced handsets in Japan with great expectations, with special designs aimed at girls and young women and special buttons that can be pushed to gain access to shopping sights. Cloud-computing---Internet-based computing in which shared resources, software and other devices are on demand---is becoming a market issue in Japan. The process began with American giants such as Amazon and Google pushing their services in Japan with Japanese and electronic companies such as NEC and Fujitsu fighting back to stake their claim in the industry. Cloud computing appeals to clients because they can hire firms to provide a range of services online and they don’t to need to maintain their own servers and IT experts. There is a lot of competition, research and development in the lithium-ion batteries, which are widely seen as the power source in hybrids and electric cars in the future as well a range of other devices. They are smaller, lighter and have greater power-storage than the nickel hydride batteries now used in most hybrid vehicles. A number of top Japanese companies, including Hitachi, Toshiba, NEC and Sanyo and others, have produced or are planning to produce factories capable of producing lithium-ion batteries for cars. Electronic companies---particularly Panasonic and Toshiba, Japan’s leading light bulb makers---have profited from the shift from incandescent light bulbs to longer-lasting and more energy-efficient LED (light emitting diode) bulbs. New video cameras introduced in 2010 included the $1,300 Panasonic HDC-TM7, capable of filming 41 hours in full high definition, $1,100 Canon Ivus Hf M31, with a device that corrects for shaking, and the $1,300 Victor-JVC Everio GZ-HM570 with wireless Bluetooth protocol that enables remote operation.